The O.J. prosecutor made mistakes, but why was he deemed a race traitor? I wrote a book about Uncle Tom, which I called “the most venomous epithet blacks can hurl at one another.” I examined blacks, both famous and not, who endured that cobra’s ferocious bite, including Darden. Many seek to drown the slur, believing it has no place in black folks’ vocabulary. But racial treachery exists. And whoever exhibits it should be attacked. Darden, though, committed no treasonous acts. Yet, Darden was brutalized for racial betrayal during the trial and long after it. He conducted interviews after the not-guilty verdict, depicting himself as a victim, forced to tend to his wounds, much like any black person stranded on the wrong side of a racial controversy. Revisiting the tale of Darden two decades later, two points come into sharper focus: First, violating some cultural rules invites vociferous and sometimes undeserved condemnation, and, second, black folk often allow whites’ perceptions of the race to lead to the mistreatment of one another. Simpson’s defense attorneys, nicknamed the Dream Team, sought at a pretrial hearing in January 1995 to include evidence they hoped would demonstrate that Los Angeles Police Department detective Mark Furhman was racist. The attorneys, more specifically, wished to put before the majority-black jury instances in which Fuhrman was said to have detonated the N-word bomb. 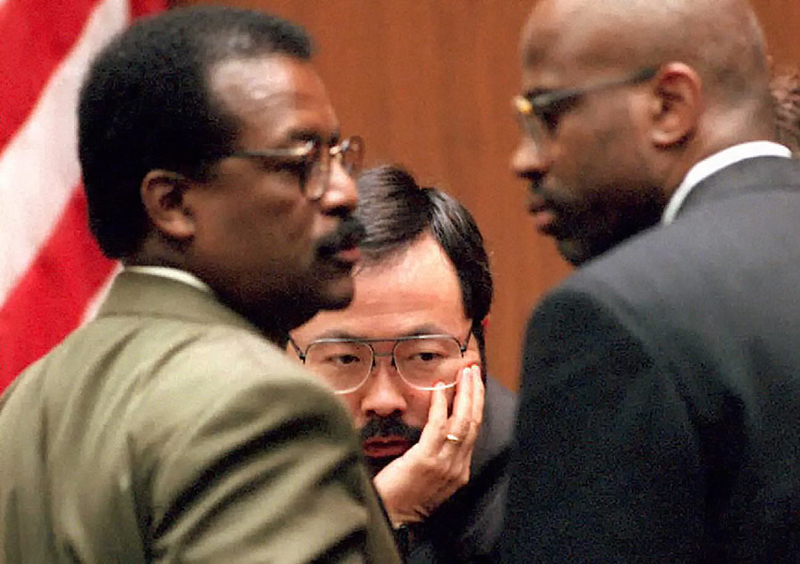 Judge Lance Ito (C), defense attorney Johnnie Cochran Jr. (L) and prosecutor Christopher Darden (R) confer in the courtroom March 8,1995. “It’s demeaning to our jury,” Cochran countered, “to say that African-Americans who’ve lived under oppression for 200-plus years in this country cannot work in the mainstream. African-Americans live with offensive words, offensive looks, offensive treatment every day of their lives. And yet they still believe in this country. Looking back, Paul Butler, a Georgetown University law professor and former federal prosecutor, rejects Darden’s argument. Darden was correct. But one can understand why he argued his point. When the Simpson trial began, the specter of the Los Angeles riots still lingered, a chaos rupturing the city along its racial fault lines. Countless tales of police brutality convinced black folk the LAPD frequently enforced white supremacy, not always law. Darden wanted this context — the context of a city embroiled in racial strife, the context of a minority population distrusting its police officers — divorced from the legal proceedings. He preferred that the case be focused on the strong physical evidence leading to Simpson being a double murderer. Darden erred. His argument slighted black folks’ capacity to hold two thoughts simultaneously: Fuhrman was a racist and Simpson killed two people. And he paid a price that pained his psyche. What followed next is engrained in American history: Simpson shrugged his hulking shoulders then lifted his hands in the air, revealing bloody gloves uncomfortably situated on his large hands, a nonverbal communication that they were too small. Don’t ask a question you don’t know the answer to. Lawyers, careful creatures, live by that maxim. Prosecutors, as best they can, plot the entire trial, showcasing a narrative that jurors end themselves by, prosecutors hope, providing a guilty verdict. O.J. Simpson shows the jury a new pair of Aris extra-large gloves, similar to the gloves found at the Bundy and Rockingham crime scene. 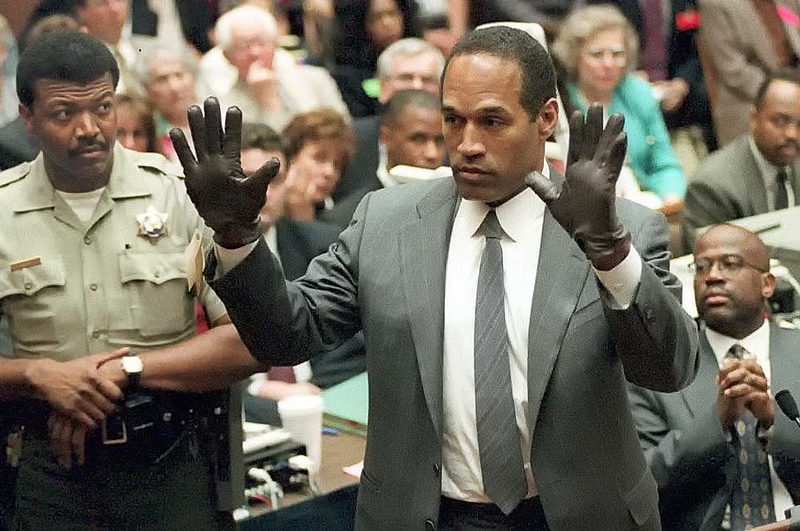 But Darden couldn’t know how the scene would close once Simpson tried on the gloves. And many thought Darden, therefore, had sinned in allowing the defendant to write the script. His fellow prosecutors on the case certainly did. After the gloves didn’t fit, Darden was, for a time, denied involvement in the prosecution’s strategy. Still, he remained on the team. Black folk rightly bristle when black people permit their melanin to torment the group. The situation typically arises when blacks employ their black skin in ways that normalize racist arguments. Our eyes roll when a black person enables a white person to say, “That’s not racist; [insert black person] here said it.” Let’s term this the Stacey Dash phenomenon. Although Butler’s outlook is understandable, we have no reason to necessarily view this through a racial lens. Why not depict Darden as suffering the consequences of his errors but staying on to redeem himself later? Requiring Darden to leave the prosecution team applies unbearable weight to living while black that we mustn’t force each other to shoulder. Darden’s participation in the Simpson trial became an issue the moment his inclusion was announced. The state wanted his black skin, so goes the theory, to send a message to black jurors: Darden, a black watchdog, ensures nothing nefarious transpires behind the curtains. A popular opinion held that Darden, therefore, should have declined the opportunity that his white bosses never would have extended but for him being black. Such thinking is deeply problematic. This position means, essentially, that we should allow white people’s thought processes to govern how we evaluate opportunities: Darden should have declined this position, not because he didn’t want it, but because whites wanted him to have it. Such misguided reasoning requires us to outsource decision-making to whites. What we individually want means nothing. We should, instead, oppose whites’ wishes, no matter what, lest we expose ourselves to ridicule. But what of our own hopes and desires? Are we to treat the white gaze as an omnipotent wind that navigates our boat no matter how we position the sails? The slave ceases to be a slave, not when he opposes his master, but when he no longer has one. If the evidence convinced Darden of Simpson’s guilt and if he believed his skills could bring the victims and their families closer to justice, he should have emptied his soul into confining Simpson behind bars. 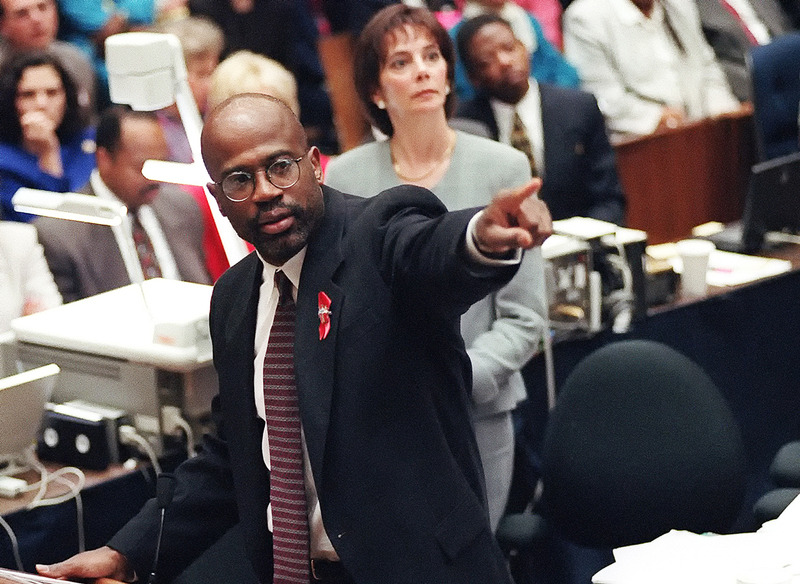 Prosecutor Christopher Darden points at a chart during his closing arguments as Marcia Clark looks on, Friday, Sept. 29, 1995. His claim seems to be that black folk should have considered any defense of Simpson with an eye focused on white people’s perceptions. Because whites might retaliate by ending affirmative action, Simpson’s black supporters should have re-evaluated their actions. This same bad logic abused Darden when he agreed to prosecute Simpson. He, without irony, wielded a weapon identical to that which maimed him before. The Darden Dilemma attracted much attention in the wake of the Simpson trial. But do blacks truly watch black prosecutors with a raised eyebrow? Jorden reports a different experience. The criminal justice system now, as since its inception, operates as a machine that produces racist results. To change that system, we must, amongst other things, deepen the shallow pool of black prosecutors. The numbers should horrify us. Ninety-five percent of nation’s elected prosecutors are white and 60 percent of states have no elected black prosecutors. As racial justice advocates exhaust themselves trying to increase those numbers, the image of Christopher Darden demands a permanent place in our minds, serving to remind all how the career of a prosecutor must become more tolerable for blacks and how black prosecutors must make the career more tolerable for themselves.